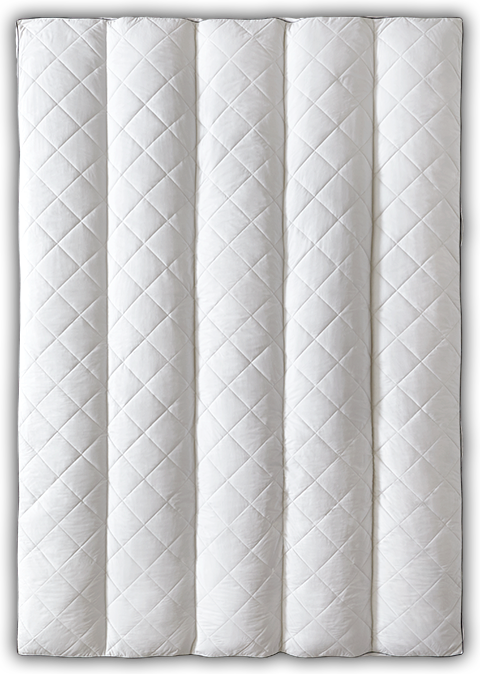 A cloudlike, feather bed mattress topper with a cushioning layer of soft quilting between you and the fluffy feather fill. The channel design keeps the feathers in place while still allowing room for you to fluff and adjust the fill so it’s right for you. I've never owned a featherbed but have always wanted one. When I found Pacific Coast online, browsed their products, and also learned that they are located and manufacture here in the US I was set. I ordered this topper and am exceptionally pleased with the product. I've never had a better nights sleep. Springy Resilia® feathers fill this super comfy feather bed finished off with an extra layer of soft quilting to cradle your body while you drift off to sleep. EuroRest® feather bed comes with a head-to-toe, baffle channel design that keeps the feathers in place while still allowing room for you to fluff and adjust the fill so it’s right for you. A gusseted edge means the feathers stay full right to the very edge of this cloudlike topper. Enjoy a durable 230 thread count, 100% cotton cover with a Barrier Weave® to keep the feathers from coming out. Also comes with convenient easy-fluff handles. Adds a luxurious touch to any bed. Our patented design features a cushioning layer of soft quilting between you and the fluffy feather fill along with head-to-toe channels that keep the feathers in place. Channel designs allow room for you to fluff and adjust the fill so it’s right for you.